Background: a few months ago, my friend Al moved to the east coast and I began promising to visit her. A few weeks ago, I finally followed through and bought plane tickets. And a few days ago, after extensive preparations (got a pedicure and watched Deadliest Warrior: George Washington vs Napoleon Bonaparte), I set out for Washington, DC! And shortly after I landed, I left DC! It turns out Al actually lives in Old Town, Alexandria, Virginia. That should tell you how much research I put into this vacation. Having followed the heat wave from Minnesota, I landed in 95 degree weather at ten p.m. Logically Al and I went out for mac and cheese, played with the cute dog (above), and crashed. I cannot overstate the heat. Record-breaking, heat-advisories, grossness. Once again using our own brand of logic, Al and I wandered around Old Town for two hours. We saw the outsides of some beautiful historical buildings and the inside of any open building with air conditioning and/or ice cream. Friday evening, we went to Captain America: The First Avenger. My official review is that it was awesome. But I’m a superhero nerd who cannot wait for The Avengers in 2012 (Whedon! ), and I have friends who named their cat Captain America, so…go somewhere else for an unbiased review. Weather update: it’s still hot beyond reason. 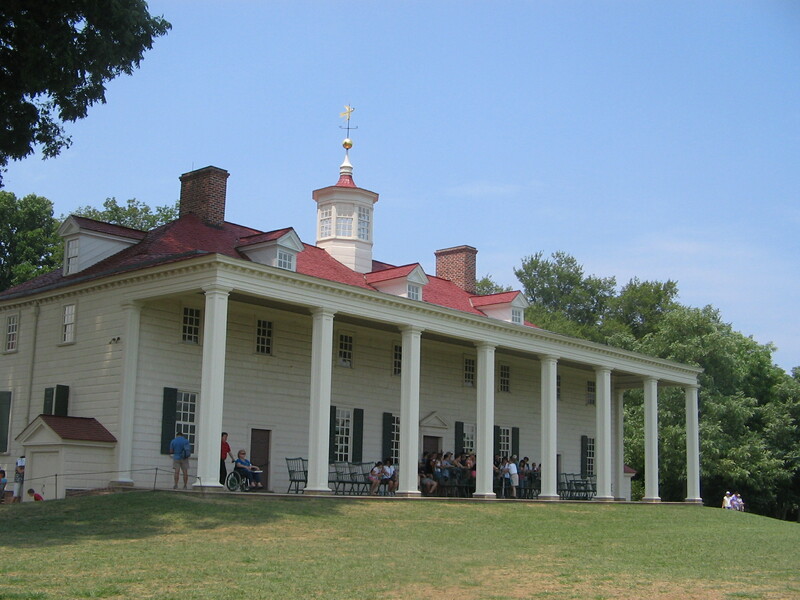 Let’s go wander around Mount Vernon! The Mount Vernon experience starts with a 20-minute video on the life of George Washington (logical) with an explanation of the museum’s highlights from Pat Sajak in colonial wear (wait, what now?). Everything is beautiful and interesting and in every picture I took I look like I’m dying of heat stroke. Pat Sajak suggested we try Martha Washington’s famous soup, but all we could find were pre-made sandwiches and chips. Do not trust colonial Pat Sajak. 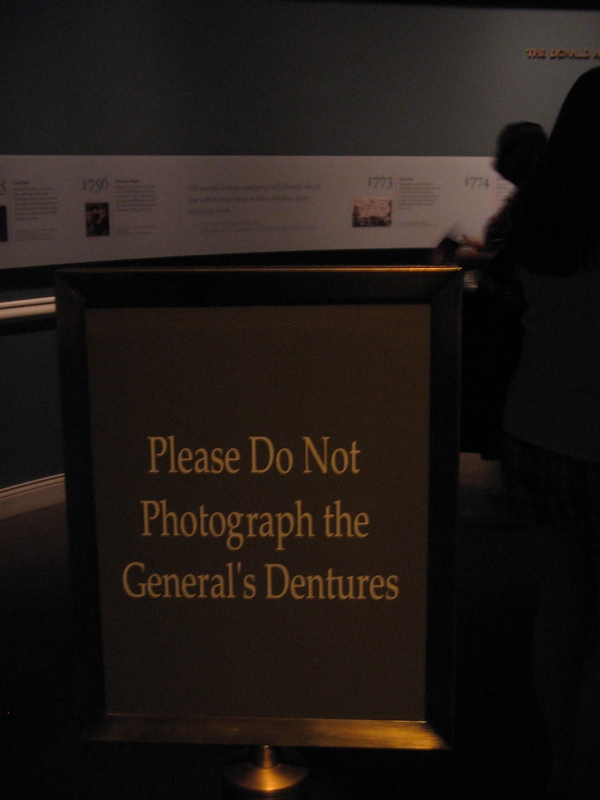 We made a quick dash through the museum portion and found George Washington’s dentures, and here’s proof! Do not even try it. After some more indoor regrouping, we went on a colonial ghost tour around Old Town. I had a great time and Al was also there. I love ghost tours — not because I believe in ghosts or want to be scared, but because I like the weird bits of history they present — but apparently not everyone does. I made it up to Al by going to an Irish pub and then a karaoke bar. 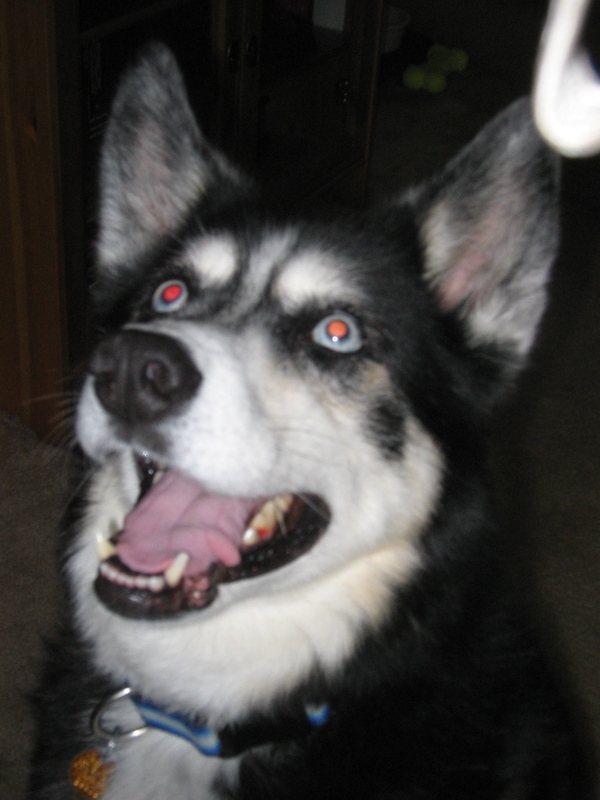 I will not be documenting that portion of the evening in a blog occasionally read by my professor, bosses, mother, and some nuns, so here's that dog again! Day Four: Church Space Nine and the National Harbor, wait we’re in Maryland now? On Sunday morning, Al and I got up and attended the church service at the historic Christ Church in Alexandria, the home church of both George Washington and Henry Lee, the father of Robert E. Lee. One of the priests at our service played Kelly Taylor’s mother on Beverly Hills, 90210, and I’m not even kidding. She also played Nurse Jabara on "Deep Space Nine." We fit one more tourist destination into my trip with a quick visit to the National Harbor, which it turns out is in Maryland. So in my entire trip — billed in discussions with friends as my “D.C. 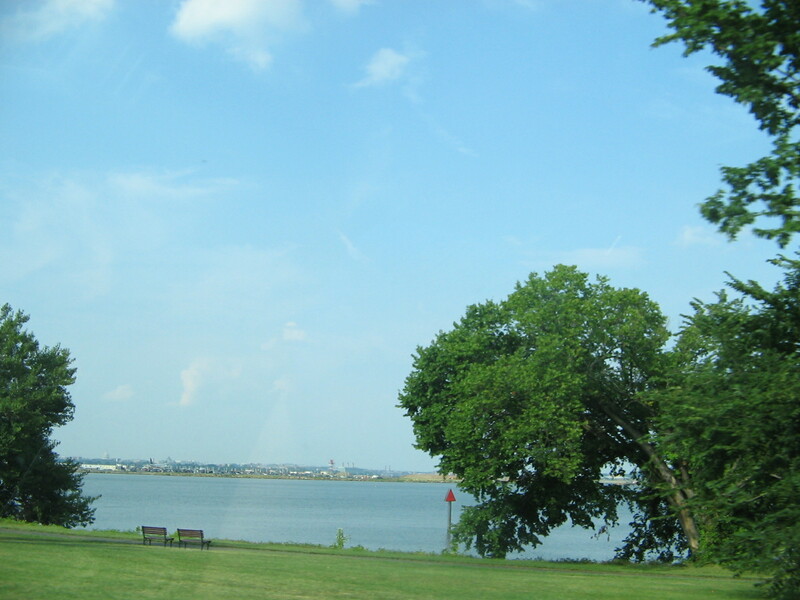 vacation” — this is about all I saw of D.C.
On the way back to the airport. No matter where I was, the trip was fantastic. Al and I giggled like we’ve done since college, I didn’t die of heatstroke, and did I mention the dog? Vacations and time with friends — those are the best things.